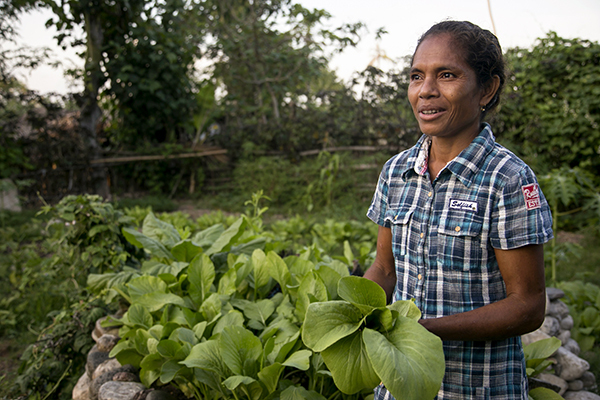 An innovative Catholic Relief Services program in Timor-Leste is showing people how gardens can help them recover from disaster. This small Southeast Asian country was only 4 years old when it held its first election in 2006, a test of the new democracy. Tragically, violence convulsed the young nation. Along with thousands of others, Joana Mascarenhas’ life was upended when her family’s home burned down during election protests. The shock of losing her home and much of her village had to be pushed aside. Joana and her husband, Hermenegildo Lopes, needed to focus on their eight children to get them through the confusion and fear. It was 6 years before Joana and Hermenegildo could rebuild their home with the help of a government grant. But its strong roof and walls did not bring back their lost possessions. CRS is helping families build a safety net against disaster through its REACT project. The project shows people new ways to store their seeds and teaches them how to grow enough nutritious vegetables to keep themselves healthy while still having a surplus to sell. With our partner Fraterna, CRS helps families establish climate resilient gardens that require very little space. 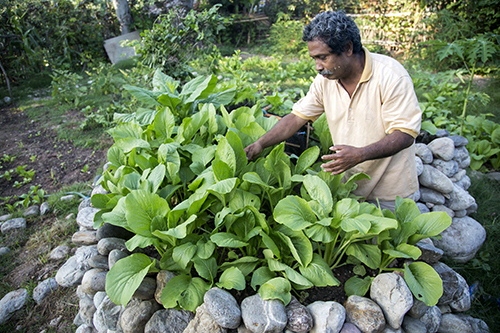 Such small gardens are easily tended and can operate on kitchen wastewater during dry periods. Vegetable and seed varieties are selected based on their nutritional value, how quickly they grow and their drought resilience. The garden designs also lead to sustainable environmental practices, natural disease and pest control, and safe seed saving and storage. This June, CRS will also introduce families to Savings and Internal Lending Communities, or SILCs. SILC members contribute to a group fund each week and, as savings build, they can take out loans for large expenses like school fees, farm animals or home repairs. Profits from interest are shared by the group. Joana says REACT helped her do just that. With the vegetables she and Hermenegildo grow using CRS techniques, they earn $50 a month. The money builds a future for their kids. Whether it’s the sudden shock of a fire or typhoon, or a slower moving crisis like changing rainfall patterns, REACT’s simple techniques mean families can succeed in spite of more violence or less rain. Now, Joana, Hermenegildo and thousands of others in Timor-Leste can prepare for, and recover from, disaster.